As you get older, your skin and connective tissue becomes less elastic, saggy and more fragile. Some wrinkles can become deep crevices or furrows and are most prominent on the face, neck, hands and forearms. Wrinkles are often a sign of poor blood circulation, a weak connective tissue, an acidification of the body, metabolic diseases, stress, mental problems and hormonal imbalance. 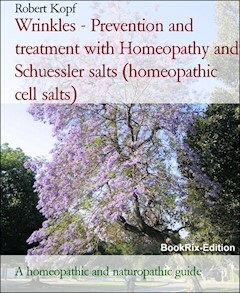 In this naturopathic adviser, I will give you recommendations how to treat and prevent wrinkles with homeopathy, Schuessler salts (also named cell salts, tissue salts) and herbal tinctures. I will present you the most proven homeopathic remedies and Schuessler salts, including the appropriate potency and dosage. I wish you much success, joy of life and especially your health. As you get older, your skin and connective tissue becomes less elastic, saggy and more fragile. Some wrinkles can become deep crevices or furrows and are most prominent on the face, neck, hands and forearms. Wrinkles are often a sign of poor blood circulation, a weak connective tissue, an acidification of the body, metabolic diseases, stress, mental problems and hormonal imbalance. In the homeopathic and biochemical treatment (Schuessler salts) and prevention of wrinkles, detoxification therapies serve the activation of metabolism, the immune system and strengthening the body's circulation and connective tissue. It cleans, de-acidifies the body, is mineralizing and leads to a balanced life energy. The body will be purified and the dissolved metabolic waste, acids and toxins are excreted through the gut, urinary tract, lungs and skin. Wrinkles can be caused and reinforced by a mineral deficiency and an acidification of the body. Mineral deficiency and acidification weaken the connective tissue of the skin and blood vessels. Also a defective metabolism favors wrinkles, acidification and chronic health problems and is often the result of a disturbance of mineral intake and mineral distribution. Although we may receive enough minerals in our food, in the event of a metabolic disorder, not all of the minerals may reach the cells. The use of Homeopathy and Schuessler salts is a good way to compensate this mineral deficiency in a natural way and to treat wrinkles. Stress, acidification of the body, as well as environmental toxins hinder the mineral transport through the cell membranes. This is where the effect of homeopathy and Schuessler salts works. They activate the excretion of toxins and acids. The basal metabolic rate increases and the self-healing power of the body is activated. Homeopathy was developed about 200 years ago by Samuel Hahnemann. The three basic principles of homeopathy are the simile rule, homeopathic drug testing and detection of individual disease. The most important principle is the principle of similarity (simile rule), which was formulated in 1796 by Hahnemann. It states that a patient should be treated with the remedy, which can cause in its original state similar symptoms in healthy people like the existing disease. It notes primarily the main complaints of the patient. Together with a few differentiating additional informations (modalities) then the right remedy will be found for the treatment of wrinkles. The dosage depends on the condition of the patient. As the patient improves, the distances between the medication will be gradually extended. What happens if you choose the wrong remedy? Nothing - just as a key does not turn in the wrong door lock, a wrong homeopathic remedy does not cause any reaction in the body. The homeopathic remedies are available as D-, C- and LM potencies. For the beginners in homeopathy, I recommend the use of lower D-potencies. Higher potencies (D200, C and LM potencies) should only be given by an expert, as they go very deep in their effects and are often used only once. In the 19th Century the german physician Dr. Wilhelm Heinrich Schuessler (1821 to 1898) developed his health cure with homeopathic mineral salts. In recent years this therapy celebrated a comeback. In his studies Schuessler discovered twelve mineral compounds, comprised each of a base and an acid, which play a crucial role in the function and structure of the body. He developed his own system with which many diseases can be treated in a natural way (also wrinkles). Schuessler focused his search on mineral salts and trace elements, which are found in every cell of the body and called his method of healing "Biochemistry" (chemistry of life). It is based on the assumption that nearly every disease is caused because of the lack of a specific mineral salt. This leads to dysregulations inside the cells. The molecules cannot flow freely. A mineral salt deficiency arises from the fact that the cells cannot optimally use the minerals. To improve their absorption, mineral salts therefore have to be highly diluted (potentized). Schuessler used the homeopathic potencies D3 (3x), D6 (6x) and D12 (12x) for his therapy. In general, the 6x (dilution 1:1 million) or 12x (1:1 trillion) is taken. In this naturopathic adviser, I will give you recommendations how to treat and prevent wrinkles with homeopathy, Schuessler salts and herbal tinctures. I will present you the most proven homeopathic remedies and Schuessler salts, including the appropriate potency and dosage. I wish you much success, joy of life and especially your health.